A special feature based on a real-time run of the Fate/Hollow Ataraxia Visual Novel's mini-game, Illya's Castle. The key characters' voice actor/actress' participate in live commentary for the duration of the game. She wants food the whole time. I think we're made for each other, no? I originally didn't intend to review this, but apparently, most of the people don't really get this episode. So, let me bring light to wher is darkness right now. Just kidding, its already written in the synopsis. 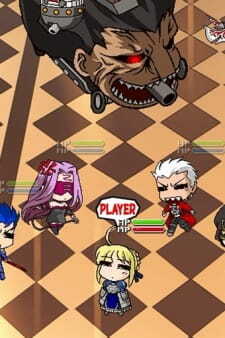 This is a an actual mini-game from Fate/Hollow Ataraxia, in which you can play as one of 5 Servants (Saber, Lancer, Archer, Rider and Caster). The version showed in the episode is commented by the cast itself, making for some hillarious jokes (Mapo, Mapo!). Well, like already mentioned, this is some kind of minigame. So there is not that much of a story to begin with. Still, these games are damn fun to watch, and are only beaten by playing them yourself. The warm arts of 16 Bit. Oh yeah. Since I'm fan of Nintendo ever since, I obviously had not the slightest problem with getting our heroes redrawn in 16 Bit style. By the way, the minigame's cover is pretty much a hommage to Nintendo. It says: Operation: Illya's Castle ~Assault Einzbern~ designed like the old nintendo package. Including Taipu-Moon in classic Nintendo logo as well. Most of the sound consists of either the cast talking or the game bgms, which are both really nice. All of our favorite characters from Fate/stay night make an appearence. Except Assassin (and some masters), again. The situation is really fun to watch, with Kirei and Illya as moderators agian. I think I rewatched this episode already 5 times. Or even more often. And I still can't help but smile, every time I see it. If you're a fan of classic 16 Bit and the Fate franchise, you won't have any problems with this. It definitely is enjoyable. First off, I'd like to say that this would be more of a side story to Fate/stay Night rather than to a side story of Carnival Phantasm, as it only has characters from Fate/stay Night. When I first began watching it, the old days of playing Game Boy Color games poured into my mind. The sound and graphics were a lot similar to the Game Boy Color games. Story? There is no real plot to this special. It is just about characters from Fate/stay Night set in a video game world where they try to defeat Ilya and Berser-car. If you are a person who can't understand Japanese and rely on reading the sub-titles, you will have a hard time. There are a lot of random dialogue in this anime so the sub-titles would just be flying at you while you are trying to watch. I find myself pausing the episode from time to time reading the sub-titles. All in all, it was pretty amusing. There was humor throughout the whole special.